One of the most asked questions that I receive is about publishing a book. So today I wanted to share some thoughts on successfully self-publishing your book (or e-book). I will be sharing more thoughts on getting a book contract in the coming weeks. As most of y'all know I have actually done both traditional publishing (accepting a contract from a book publishing company) and have also independently published my book using Amazon's CreateSpace website. I hope that these tips will help y'all as you embark on this exciting adventure! (2) Take time to make your book look professional. In a day and age when even well-known authors are independently publishing you want to make sure that your book looks as professional (or more professional!) then your competitors. Gone are the days when you are a lonely island self-publishing your work. In today's market it is wise to build a team that will help make your book the success that you want it to be. (3) Clarify what your goals are for your book. I can't even begin to count how many emails that I receive from people who "want help and direction" with getting a book published but haven't even thought through what their goals of their book are. Understanding what your goals are will change the course of every step you take. For example: are you hoping to self-publish to ultimately become a full-time writer (and hopefully get noticed by a traditional publishing company)? Or are you hoping that your book will have a huge impact on a certain group of people? Has it simply been your dream to have a book published and you don't plan to write another one? Or are you hoping to hit the New York Times Best Seller List? (4) While independently publishing your book is easy, making it successful is a lot of work. One of the things I hear the most from readers is, "I am just going to self-publish because it is so much easier than getting a book contract" I hate to say this but in some ways you are right and some ways you are very wrong. I think it really depends on your goals for your book. If you are simply hoping to see your name on a book that is published then it is incredibly easy. Even easier and cheaper is publishing an e-book. BUT if you have goals that are beyond just seeing your name on a book then you are going to have to put lots and lots of time into your project. (5) Because self-publishing is easy everyone is doing it and you will need to work ten times harder to get your book noticed. One of the important things to keep in mind is that because it is "easy to publish" everyone and their mother is publishing a book. If you are looking to build a reputation for writing, create a writing portfolio, etc. you are going to want to spend the time to make sure that your book is unique, has an interesting view point, and looks professional. You will need to work ten times as hard to make sure that your book is getting noticed. The reality is that leaders in the industry say that less than 5% of self-published books are "decent" and less than 1% are actually "good". This is an incredibly low number and you want to make sure that you are working towards hitting this number. (6) Selling 100-150 copies of your self-published book is considered successful in the industry. When I first heard this number my mouth dropped open and thought to myself, "I won't be one of those people" but the reality is that to get my books beyond this number has taken a lot of work behind the scenes. Without having a marketing team you are responsible for marketing your book, getting it into bookstores (which can be extremely difficult), and getting the word out. A shocking reality for a number of you sweet readers was when I shared in a post "10 ways to support your friends who have independently published books" that you should encourage your friends to buy your book. Many people were shocked I would actually say that. I am going to share some hard truth. For both of my self-published books over 98% of my book sales are from people I don't know. Yes, my sweet parents, sister, and best friends bought the book but beyond that I know of 8 facebook friends who purchased one of them. This isn't to "bash" anyone, but to simply share the reality that it takes a lot of work to get your self-published book to sell. I was so glad when a successful author told me before I published my first book, "Pray and decide what success is to you for your book". Having thought, prayed, and decided this ahead of time allows me to know that my success is not based on the number of books I have sold. Take the time to consider of how you will think of your book as being successful or not. It will be worth the time! (7) Understand that even if your book is amazing, it might not sell. Because your book is independently published you will be doing all of the marketing yourself (unless you hire a team which can be incredibly expensive). Understanding this shouldn't be a discouragement but a fact that you can face and decide how you can work hard to get your book noticed and selling. A lot of people say this as a word of warning but if you love writing and believe in your book you can put the extra work in to get your book noticed. Yes, it takes a ton of time. Full disclosure? I spend approximately 15-25 hours on each of my books on marketing each week. LOTS of time. LOTS of rejections, but also a lot of rewards when I see that the books continue to sell. Again, you want to remember what your goal is with your book, I am so thankful for each and every sale because it does help me pay for my treatment right now but the reality is that this is not enough for me to have as an income each month because I am not selling thousands of books each month. BUT because my goals with my two books, particularly, "Praying through Lyme Disease" was meant to be an encouragement I am very peaceful about this. My goal was to simply encourage Lyme patients in some of the darkest days of their lives. Many patients struggle to pay for treatment and can't even afford the book so I am often sending this book out free of charge. A couple of months ago I was contacted by a Polish doctor and pastor who wanted to translate the book into Polish for Lyme Disease patients. I simply handed him permission to do so without paying for the translation. Again, my objectives and goals with my books are clear so these are easy decisions for me. But understanding what kind of money you will actually make, how to set the price for your book, and how you will handle the royalty system are very important parts of this journey. (9) Reviews, Reviews, Reviews. Getting reviews is very important for your independently published book. You will want your reviews to be from those outside of your family (*smiles*) and you will want to have honest reviews that can help convince potential readers that your book is worth reading, even if you are unknown as an author. As a disclaimer though be aware that not all reviews will be profitable. Several months ago after my second book, "Prayers for the Single Journey" was released I mentioned in a bloggy group that I am apart of that I was looking for people to review my book. I heard back from 7 people, I shipped my book out (even sending one overseas) and then never heard anything again. I had discussed with each of these ladies beforehand that I was looking for a review on their blog and also on Amazon but never heard a response. After contacting each of them several times with no response I finally realized that I had fallen prey to the "free book club" (as it is nicknamed in writing world). Understand that reviews are incredibly important but learn from my experience and pick those that are going to review your book very carefully. On the flip side of the experience that I just shared I think it is definitely worth your time to send your self-published book out to those that you hope will review it that are in your field. These are people who fit your industry and have a voice in your industry. Sending your book for a review to these people is worth the risk! (10) Build a platform. If you are going to be successful in independently publishing your book, you will need to build a platform. This can be done in a myriad of different ways (writing a blog, creating a social media presence, answering questions on the internet about your subject area, speaking events, etc.) but it will need to be done. Don't turn down any small opportunity to build your platform and mention your book. You have no idea how important building your platform is and how important this is to the success of your independent book. Take risks, put yourself out there, and start building a platform. (11) Write. Write. Write. I once read a famous author say that he was always writing and doing three things in his field all at the same time: he was promoting his book that was just released, he was editing his next book, and he was writing a current book. Honestly, this has stuck with me and after having a couple of books out I completely understand this. I am always writing. I hear a lot of times from readers who say they want to be writers. I often email back encouragement and then say, "so what are you writing?" I am not exaggerating when I say that 9 out of 10 of them say, "oh nothing yet". It can be overwhelming at the beginning but spend time everyday writing a little. Practice writing and as you do it everyday you will improve. (12) Read. Read. Read. As much time as you spend writing, spend time reading other authors. Don't just pick authors that you like, pick authors that challenge you and use this as a way to improve on your language, your spelling, your content, and your grammar. (13) Purchase your own ISBN number. I shared a whole post on this which you can find HERE! (14) Pick your cover design carefully. Your cover will be just as important as your book title to many people. We are such a visual society that often times the cover design is equally as important as the book title. Choose this very carefully. I was incredibly blessed by my sweet friend Amanda for her willingness to let me use her beautiful photo for my book, "Prayers for the Single Journey". It was the perfect "feel" for the book and I have received so many emails complimenting how much the cover drew them into purchasing the book. In the same manner, I chose the cover for my book "Praying through Lyme Disease" very carefully as I wanted it to invoke the feeling of walking a long path through a woods. Think about what you want people to feel as they look at your book and carefully spend time choosing your cover design. (15) Choose your title carefully. (16) Hire an editor for your book. This is extremely important to help your independently published book become successful. If you can't afford to hire a professional editor consider contacting your local university or college's English department to see if they have any graduate students who are looking for editorial work for their resume. This can help cut the cost for you and also help a graduate student out who is looking to build their resume. (17) Create an Audio Book. I haven't done this yet, but am currently working on this. Interestingly enough, experts in the field agree that having an audio book helps make your book more "credible". (18) Develop a Marketing Plan for your Book. Take the time to develop a marketing plan for your book. This is extremely important. I am going to share a whole post about this in the future also but start thinking about your marketing plan now! (19) Create your Author Central Page on Amazon. This should be one of the first things that you do if you are selling your book on Amazon (which you should also do!) Create your Author Central Page and connect it to your social media (and your blog if you have one!). I am honestly shocked at how few self-published authors have done this. This is a FREE resource so you want to take advantage of it! (20) Foreword. If possible try to get someone in your field who will write a foreword for you. This might take some time and it might take you a few books but try and find someone who will do this. This can be an incredible marketing tool for your book! I hope these 20 tips are helpful y'all! What about you? 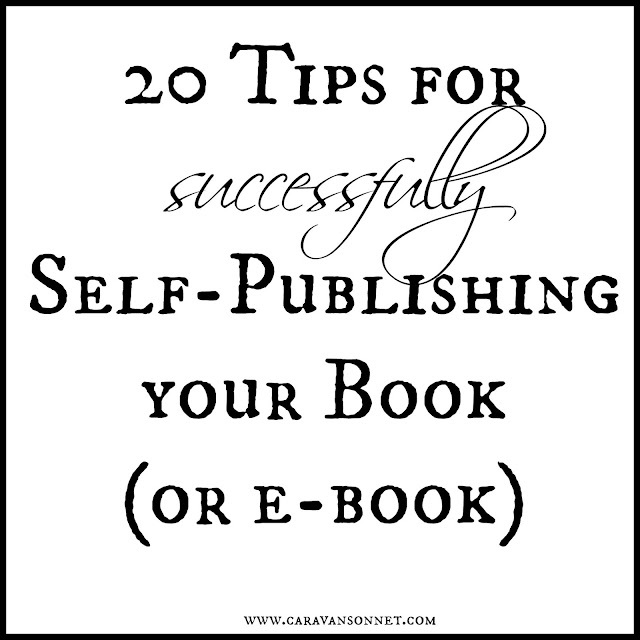 Do you have an tips for successfully self-publishing your book (or e-book)? I would love to hear them! This is some great (and very timely!) advice. I especially really benefited from hearing number 6, because as someone who has never published a book before, I had very little idea of what constitutes 'success' in the industry. Thank you! Sara, I am so glad that you found this post to be some helpful and timely advice! I am also glad that #6 was helpful! I found that information very helpful myself when I was just beginning!! :) Thanks so much for stopping by and sharing!! Great stuff. I am a long way off from the finished product, but there were some really good nuggets here I would not have thought of. Thanks for sharing your wisdom. Thank you so much for stopping by and for sharing!! Good Luck as you finish your product!! Would love to hear more about it as you continue on! I am working toward publishing very slowly at a snail's pace. I don't know if I will ever have another book. I do have two anthologies that I edited. I was paid a straight project pay. Now, I like the sound of going back to pay for hire for books. I made $1,500 for each book. Hi Mary! Thank you so much for stopping by and sharing a little bit of a journey! That is wonderful that you have experience in editing anthologies. I am sure that helps you as you are writing your book? What book are you working on currently? I would love to hear more about your current project! Thanks so much for taking the time to comment! This is so helpful! I've had an idea in my head for a book for awhile now, but I've had no idea where to start as far as writing and then publishing it! I was happy to read this post! Thank you!!! Emily, Hi! Thank you so much for stopping by and for sharing! I am so glad that you found this post helpful!! Good Luck as you start this adventure! I would love to hear more about your book as time continues!! Thank you again for stopping by and taking the time to comment! This is so good! Pinning now!!!! So glad that you found it helpful friend!! :) Can't wait to read your book when the time comes!! It is hard to get reviews, I've found--even when asking friends who I know have already bought and read my book--it's difficult to encourage them to get to the next step of writing a review. I edited a self-published book for a friend--it was her first novel, so she's offering it solely as a free ebook while she finishes up her second novel. That can be a good way to get your name 'out there' although it's obviously not financially lucrative at all. She's up to nearly 700 downloads of that book, last I heard, which is exciting as a brand-new author. Hope you are having a wonderful week so far! Thanks so much for stopping by and taking the time to share and comment on this post! I am really considering writing an ebook on idk yet.... lol. I have a few ideas but I feel like everything has been done or can be found online already. How do you inspire inspiration?